Kaelin Tillery and Richard Duggan’s colorful tumblers spell “love” in American Sign Language. Show someone special that you L-O-V-E them with this set of four screen printed tumblers. (Even if that person is you.) 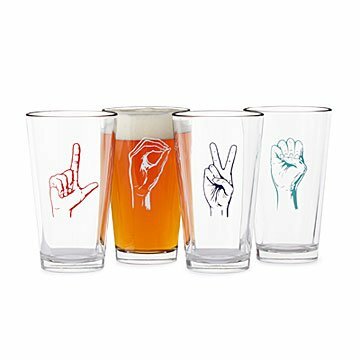 Each pint glass features a colorful hand—two female and two male—forming a letter in American Sign Language (ASL). Together, the letters, illustrated by husband-and-wife team Kaelin Tillery and Richard Duggan, spell out "love." Pick up a set to show your appreciation for ASL, give everyday drinks a little extra TLC, or send a friend a meaningful message. Illustrated and screen printed in Denver, Colorado. Glasses made in Ohio. First they forged a friendship, but that turned into a marriage, a house, a family of random animals, and business together. “We did the logical thing,” they explain, “and put our art educations together and began designing.” Each of those designs starts out as a pencil sketch, then they ink their illustrations and prepare them for screen printing in their studio in Denver—the city “the universe” finally settled them in. Hand wash recommended. Top rack dishwasher safe.